Kingdom Hearts 3 is real, it's strong, and it is my friend. Kingdom Hearts 3 always wants you to remember that you're playing a game made in collaboration with Disney. Like a college student realizing they're free from their parents' watchful eyes for the first time, Square Enix is going absolutely wild with the Disney references. My hour and a half with the game was an explosion of bright lights and spectacle from beginning to end. 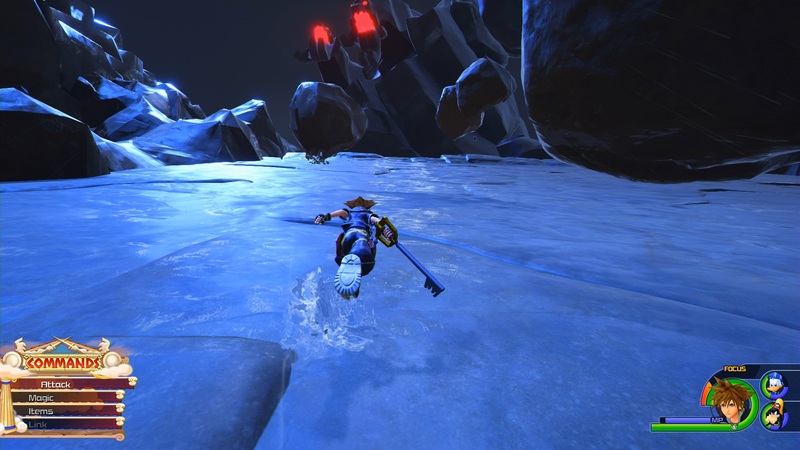 Screenshots from Xbox One and PlayStation 4 versions of Kingdom Hearts 3. Yesterday was the first time that Square Enix has let Kingdom Hearts 3 free since the game was first announced way back E3 2013. I was able to sit down, controller in hand (an Xbox One controller for my demo station) and see everything series creator Tetsuya Nomura and his team have put into the last entry of the primary Kingdom Hearts trilogy. The demo offers two sections for play. The first and shorter of the two is Olympus, the world of Disney's Hercules. While the world was just the Olympus Coliseum in the first game with the addition of the Underworld in Kingdom Hearts II, this chunk represents another expansion. Sora, Donald, and Goofy are up against one of the Titans of myth, a giant hulking beast of stone that's throwing rocks down at the team from a high mountain. You have to scale the mountain to reach it. One thing that's immediately apparent is the new vertical nature of Sora's movement. In addition to the new Autorunning feature that sees Sora automatically vaulting over small rocks, boxes, platforms, and other objects in his way, our hero can now run directly up certain walls. These walls are marked by a persistent sheen; run into one and Sora will keep going in the same direction up the wall. You can even change direction without falling off. Running right up the side of the mountain while dodging incoming boulders, Sora finally reaches the Titan itself. You have to attack the Titan's feet until it falls and then leap up to its head to deal higher damage. It's here that one of the new Disney-centric features appears, the all-new Attractions. 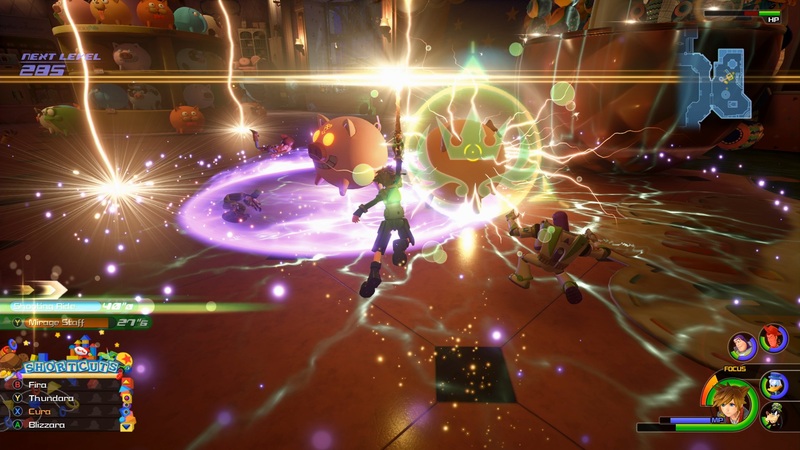 Kingdom Hearts 3 expands upon the Reaction Commands introduced in Kingdom Hearts via Attractions and a whole host of other attacks. Attractions are special attacks that are situational and based on rides from Disney theme parks. The Attraction in the Titan fight is Big Magic Mountain (likely based on Big Thunder Mountain Railroad), a mighty flying train that soars around the huge beast and shoots fireworks at it. The Attractions seem regional, but not always related to where you are, so while they're impressive, they don't always fit the situation. The Toy Box world related to Pixar's Toy Story featured Attraction attacks for Pirate Ship (which isn't quite a Disney thing), Shooting Ride, and Splash Run for no particular reason I could figure out. Speaking of the Toy Box, finishing off the Titan with the power of Big Magic Mountain closed out that part of the demo, leaving me with the larger Toy Story section. Sora and company find themselves in Andy's room from the Pixar film, where half of the toys have mysteriously disappeared. Woody and Buzz view the team with skepticism, but after seeing them take out the Heartless, they begrudgingly accept their help. The walls of Andy's room factor into the wall-running feature, allowing you to climb and jump to look for hidden goodies. The story moves forward when you jump out of the the window and down the roof to head to the local toy store. The Toy Box level offers a few more options in terms of combat. Not only are there the Attractions and Reaction Command attacks for Donald and Goofy (Goofy Shot and Flare Force respectively), there's also an additional Reaction for the Buzz and Woody duo. 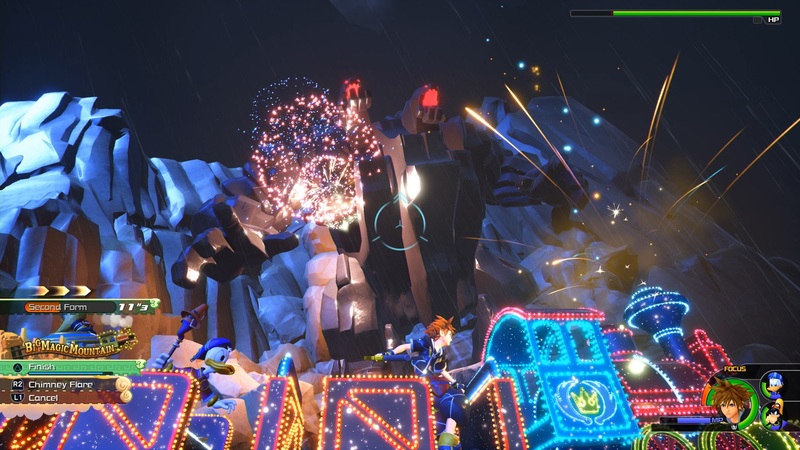 Rocket Ruckus sees Sora, Buzz, and Woody jump on a rocket that can be piloted around the battlefield; hitting the Finish sends the rocket hurtling towards a target as the three jump off. 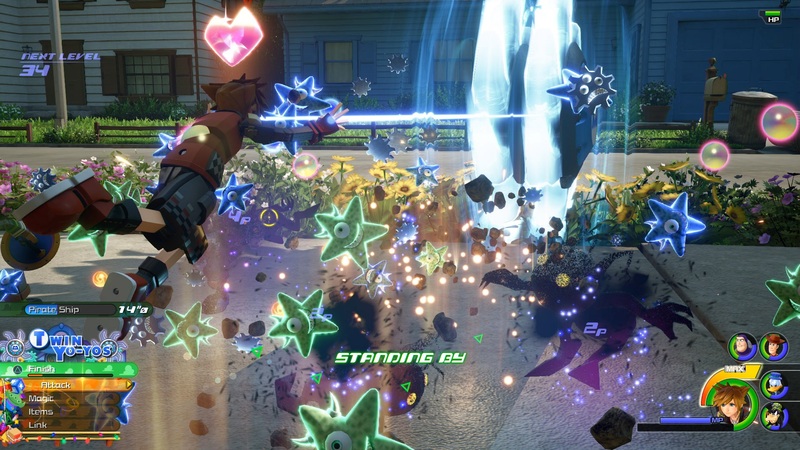 This part of the demo also offers multiple Keyblades. Infinity Badge is the Keyblade related to Toy Story itself, looking like a cactus with a deputy's star embedded in it. Its powered-up attack is Hyper Hammer, a giant rocket mallet that cracks the ground on the last hit of its combo. The Monsters, Inc.-themed Keyblade whose name I unfortunately missed, offers Agile Claws and Twin Yo-Yo as its special attacks, giving Sora robot claws to fly around the battlefield scratching up trouble or giant yo-yos to ping-pong around. Smile Gear seemed to be based on the Mad Tea Party from Alice in Wonderland; its upgraded attack is Mad Tea Cups, letting you ride around in the Disneyland Tea Cups ride. The Finish sees Sora, Donald, and Goofy's tea cups smash together for an explosive attack. 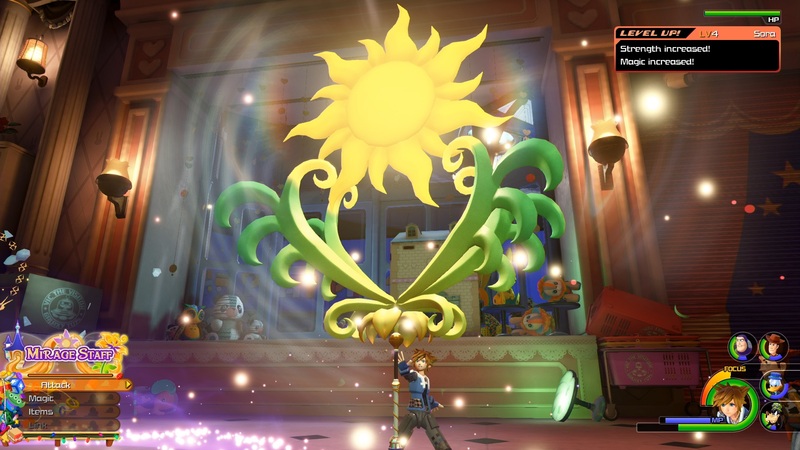 The most powerful Keyblade available in the demo was Ever After, which is based on the Tangled universe. The keyblade powers up into the Mirage Staff, whose magic offers some powerful long-range attacks, but the Finish is the real winner: Rapunzel's tower is summoned out of the ground dealing damage to every enemy nearby. It was my keyblade of choice. In the toy store, Galaxy Toys, the crew meets Young Xehanort briefly, and the game leans on the weirder side of Kingdom Hearts for a bit. Xehanort explains his plan, involving darkness, cloned worlds, and splitting souls, before bringing a giant robot toy called Gigas to life and splitting. You have to fight multiple Heartless and Gigas, but Sora evens the score by bringing his own Gigas to life. You can pilot the robot around, shooting enemies with blasters or hitting them with a massive robot punch. This mechanic is actually carried through the rest of the toy store region. Whenever a fight involves a Gigas—there are three flavors—you can pilot a fallen one. It's really fun and extends the base gameplay in a different direction. You can stay with the keyblade slashing, but who doesn't want to pilot a robot? This part of the demo is also where I figured out the new Link system, which replaces the Summons from previous Kingdom Hearts titles. Lagoon Showtime summons Ariel from The Little Mermaid to help. She dives into the earth itself as if it was water and Sora can do the same. When you finish the attack, each of the spots that Ariel and Sora dove into explode in a fountain of shining water. There's also 8-Bit Blast, which summons Wreck-It Ralph from a Fix-It Felix cabinet. 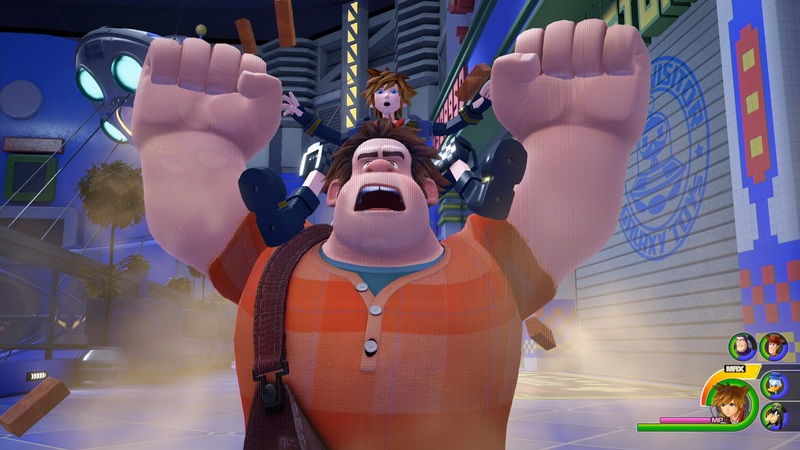 Sora can ride Ralph, while the big man places blocks on the battlefield. The Finish sees Ralph destroying all of the blocks in one big attack before fading away. The toy store itself is pretty sizable, with three floors accessed through a giant gumball machine in the middle. There's also vents to explore that connect certain stores. Your journey carries you through a game store where you fight the dragon-like Supreme Smasher from a game called Monstrous Monsters, and Babies and Toddlers, where you have to fight what looks to be an off-brand Disney's Descendants doll. Completing the latter event ends the second part of the demo. One thing that struck me the entire time was how exuberant Kingdom Hearts is. 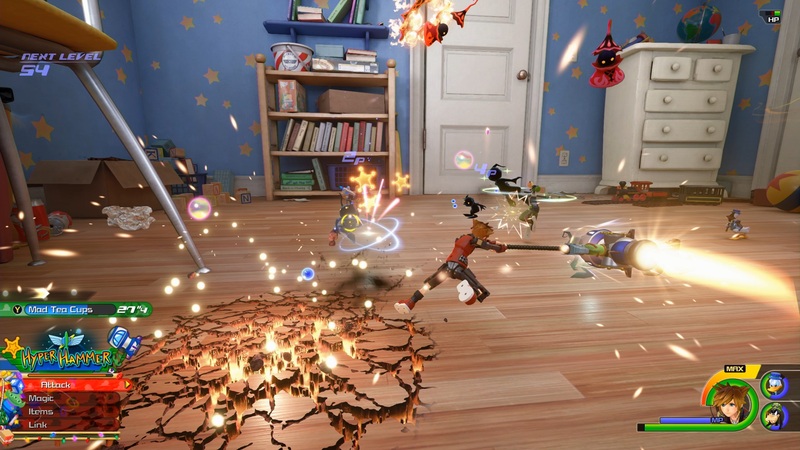 Square Enix is using Disney and the new Unreal Engine to its fullest. Everything pops. All of the Attractions are based around vehicles that are completely decked out in bright colored lights, like an actual theme park. The Link summons for Wreck-It Ralph and Ariel are graphically intensive, especially the watery explosions of Ariel's finishing move. The Ever After Keyblade manifests an entire goddamn tower out of nowhere. Between all these different situational attacks and Disney references, it feels like the demo is always exploding in your face. It's hyped to be playing around in the Disney universe and it's excited to be the first mainline Kingdom Hearts since 2005. Kingdom Hearts 3 is a friend who's really excited to tell you all about the hobby they've been getting back into lately. 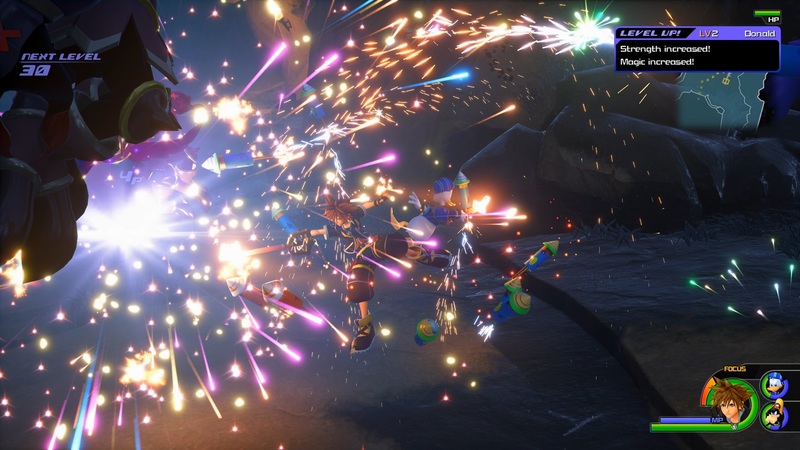 At times, it felt like a bit much, but I think that's the result of the demo wanting to give players a good idea of what will be coming in Kingdom Hearts 3. It's condensed, so everything is just hitting all at once, instead of being parceled out over many hours. Like a trailer for an action movie. Kingdom Hearts 3 is probably everything Kingdom Hearts fans have been waiting for all these years. I'm not the biggest fan on the series, getting most of my experience through either contact high or short periods with remasters. But I had fun with the demo and having it in front of me and controllable convinced me that maybe, just maybe, the game will actually come out soon. And when it does, I might give it a shot. Tagged with Action,	Analyses,	PlayStation 4,	Square Enix,	Xbox One.